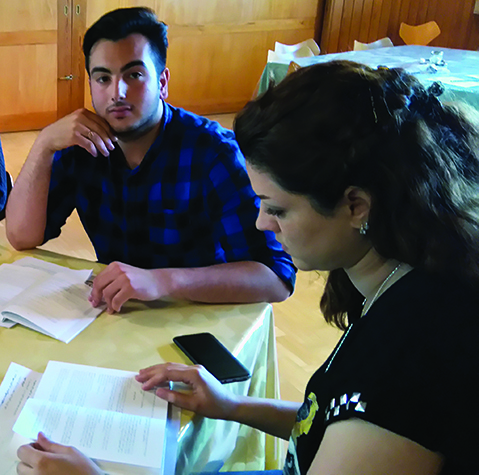 In Denmark, two immigrants study the Farsi catechism together. As waves of refugees and migrants came in 2015, there were hundreds of Iranians and Syrians in Denmark. The Iranians (former Shia Muslims) were seeking Christian fellowship, and some of them came into our Lutheran churches. Now lately Syrians and Africans (Somali, Sudanese and from the Berber countries), who are mostly former Sunni Muslims, are seeking churches. Not many people in the churches here were able to speak Farsi, so Christian mission were done by anyone who could help and by any literature that was available. As soon as we had access to LHF’s Farsi catechisms from Germany, we could safely let them read and take in everything. Since that time, LHF’s Dari-language prayer book has also arrived, which for many has been a wonderful help to pray (because Muslims come from a tradition of prayer, and they find it very unique and different to pray to our Heavenly Father). The books have been distributed to the major refugee centers (10 different places), where anyone could take a hand in Lutheran teaching. At a refugee center in North of Jutland there were about 100 Iranians seeking the church. Some had been moved around from other churches, so the church there did not have anyone ready to bring catechetical teaching. The locals called for some catechisms and gave them to the Iranians. They started to read in groups – learning by heart – and as they became better and better in Danish, they clearly showed a faith and understanding of Lutheran belief. Similarly, there is a refugee center close to Bording in central Jutland, where Iranians due to be sent home await for being sent back to Iran (who do not take forced returns). Every Wednesday evening, there is a café. Those 50 men there (women are allowed to stay in Denmark) have more or less all read the Farsi Small Catechism, and several have come to faith. This has given hope to these men, not only for asylum, but also the hope coming through the belief in Christ. One of the pastors wrote me that now they use Luther’s Small Catechism in Farsi as basis book for catechumen teaching. It is a pedagogical genius book, as it simply crosses over from time and culture! Another man, an engineer volunteering in the work, told me about an Iranian family who was about to be sent back home to Iran. The father is unable to read, so he didn’t know how to prepare for the required interviews with the government. At his interview, this father was asked if he could explain the meaning of Easter and Pentecost – and why he had joined a Lutheran church. His answer showed that he had learned the catechism by heart, as he replied that first of all, the Christian church is a place where love and loving people meet you – not like in a mosque. Regarding Pentecost he said, “This is where Jesus’ Spirit comes into me and changes me to be one with those who believe in Him.” This man had learned basic Christian faith by heart from his family’s reciting of the catechism! Only with your help can this important work continue. Prayerfully consider how you can help support LHF projects like the Farsi Small Catechism.